Spirit of Free Beer (SoFB) Homebrew Competition – See the Winners Below! This month’s popular vote competition was held in conjunction with BURP’s Annual Chili Cook Off and was for the “Best Beer with Chili”. There were a total of eight very different entries for this year’s competition, including an international pale lager, a historical beer, a helles bock, a Flanders brown, a fruit beer, a DIPA and two IPAs. Surprisingly the most exotic ingredient was freshly picked peaches in Thomas Sords’ “Peach-ish Wheat”, which paired particularly well with Team Traitor Steve Marler’s cricket-containing “Chirping Chili”. All of the beers were delicious, but after the competition’s proverbial chili powder had settled and the votes were cast, we had our winners. Tim Artz came in third place with his Flanders brown called “Divine Wind”, which clocked in at 7.2% ABV and was barrel-aged in French Oak. Second place went to Mike Reinitz’s historical Kentucky Common simply called “KY”. Lastly, the mighty Dickheads (the Cannons and Crowes) took home first place with their Maicock Honey Double Maibock and cemented their place in history with a repeat win. 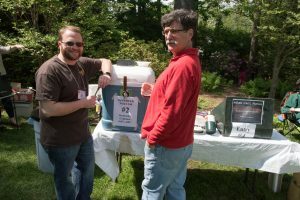 Tom Cannon was kind enough to share their multi award-winning helles bock recipe, which is below. Congratulations to all of our winners. Become a member of BURP today!